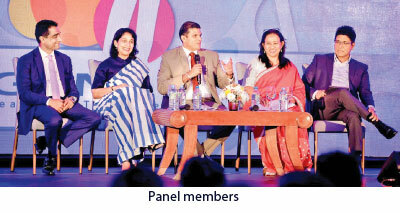 The 33rd International CA Students’ Conference was held on March 12 at Hilton Colombo. This year the Chartered Accountants Students’ Society themed the conference as ‘Generation Y - Realizing the Potential’ which was a forum to explore the distinguishing characteristics and generational archetypes of Generation Y. This conference witnessed the participation of over 600 CA Students from across Sri Lanka and 16 overseas student delegates from India, Pakistan and Nepal. Jagath Perera, President of the Institute of Chartered Accountants of Sri Lanka, chaired the conference as the Chief Guest. Prasana Liyanage the Chief Executive Officer of The Institute of Chartered Accountants of Sri Lanka, Manil Jayasinghe, Vice President of Chartered Accountants of Sri Lanka and Sujeewa Rajpakshe, Past President of CA Sri Lanka were present as the guests of honors. Reyaz Mihular, the Patron of the CA Students’ Society has extended his wishes to the conference as he was out of the country at the day. The conference was inaugurated highlighting the fact that this was the 38th anniversary of the CA Students’ Society and the 33rd International CA Students’ Conference. Kasun Liyanage, President of the CA Students’ Society, warmly welcomed the gathering to this mega conference. He highlighted the importance of contribution made by Generation Y employees to work place. He also extended his wishes to enjoy the conference and to gather everything possible from the conference. Jagath Perera, President of CA Sri Lanka, in his speech thanked the CA Students Society for coming up with timely themes and thereby taking the CA Students to the next level. He also highlighted about integrity and how companies need to develop it from the beginning. Further he touched on integrity as a financial quality when employers are hiring employees. Asitha Pinnaduwa, the key note speaker of the conference stressed on the fact that it is critical to understand that generations are not a box they are powerful clues and connecting people with different ages. Dhanika Perera, Founder/ CEO of Bhasha Lanka (Pvt) Ltd, touched on a key aspect referring the topic of challenging the status quo. He had an interactive session with the crowd bringing down with practical scenarios. The expert panel discussion was chaired by the moderator, Tishan Subasinghe who is the joint managing partner at Moore Stephens Aiyar along with Dr. Dayan Rajapakse, the Group Managing Director of Esoft Metro Campus, Anoji De Silva, Partner at Ernst & Young, Mr. Malinga Arsakularatne, the Managing Director of Leisure Travel Aviation Group and Executive Director at Hemas Holdings PLC and M Varuni Amunugama Fernando, the Joint Managing Director at Triad (Pvt) Ltd ad Director of Derana. They discussed their views on how generation gap has been created, followed by an informative question and answer session. Dr. Buddhima Subasinghe, Head Department of Computer Science, School of Computing at National Institute of Business Management enlightened the crowd with an inspirational approach. She also brought forward that life is a beautiful journey it has lot of ups and downs twists and turns it is not merely one destination. Dulinda Perera, Founder/ CEO of IKON Marketing highlighted the fact that the Generation Y is where people struggle and struggle to achieve something. The student panel discussion proved to be one of the most informative and interactive discussions of the day which was themed as ‘We are change makers’. The panel consisted of Thilini Jayathunga, the moderator, Sachindi Fernando, CA Student Presenter from Sri Lanka and CA Student Panellists, Ashwini Thivakaran, Sri Lanka, Kunal Lunawat, India, Haris Hanif, Pakstan and Ms. Prakriti Aryal, Nepal. Ending the conference, Mohamed Nawasir , the Educational Secretary of the CA Students’ Society, thanked the guest speakers, SAFA delegates and the CA students in his vote of thanks. He also thanked the sponsors for their generosity and corporation for making this event a success. This year Bank of Ceylon and Imagine Entertainment partnered with the CA Students’ Society as the Platinum Sponsors which led the event on conclude on such a massive scale. Taian Lanka Steel Company (Pvt) Ltd strengthened the conference as the Gold Sponsor. Esoft Metro Campus stood as the Silver Sponsor while Sri Lanka Telecom – Mobitel and IAS joined hands as Bronze Sponsors. The generosity and the support of the sponsors are highly appreciated in making this event a massive success. Furthermore, the efforts of LAFALA, the Official Hospitality Partner, American Premium Water, the Official Beverage Partner, Kith Arts, the Official Photography Partner, Lake House – Daily News, the Official Print Media Partner, and Siyatha FM, Siyatha TV, Kiss FM and Real FM, the Official Electronic Media Partner are highly recognized. “Infinite thanks to the CA Students’ Society of Sri Lanka for their dedication, effort and hospitality. I’ll always be grateful to you all,” said by the foreign delegates and they were very interactive all throughout the sessions and commented that the conference was very well organized. 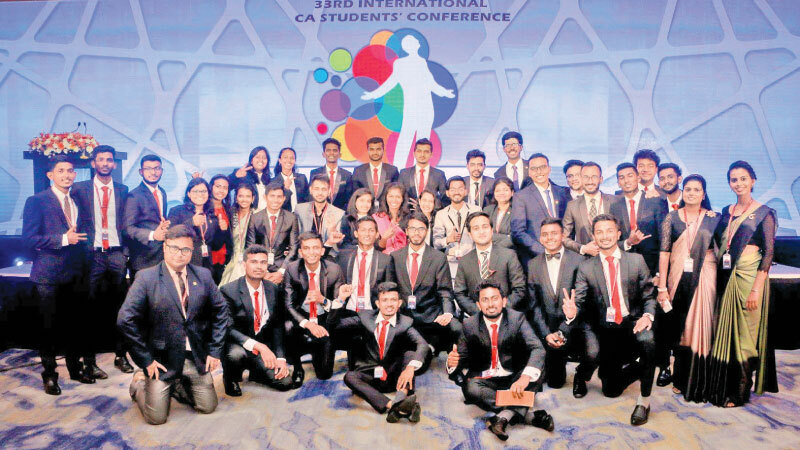 The 33rd edition of the CA Students’ Conference – ‘Gen Y – Realizing the Potential,’ was brought forward to emphasize the requirement of identifying the potential of millennials to drive tomorrow’s business world. This conference provided the ideal platform to trigger the potential in millennials to cater to the changing expectations of the world. Finally, efforts, support and guidance from all the eminent personalities of CA Sri Lanka, including staff and all the participants of this conference were thanked for making this conference a remarkable success.